I struggled to choose a single book for the month, feeling like there were several books equally deserving of the title. But in the end I’ve decided on Sulari Gentill’s MILES OFF COURSE which I finished two weeks ago but which still puts a smile on my face when I think of it. There is something I particularly treasure about a book that makes me happy and this combination of whodunnit, exploration of a lesser-known part of our history and old-fashioned fun is an absolute delight. What about you…was January a good reading month? Did you have a favourite book? Or did you acquire anything you’re itching to read? Any issue you need to get off your chest? 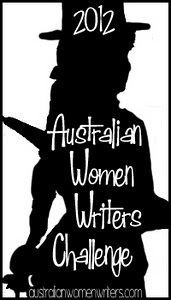 This entry was posted in Australian Women Writers Challenge 2012, books of the month, Caroline Overington (Aus), Elly Griffiths, James Thompson, list, Sue Grafton, Sulari Gentill (Aus). Bookmark the permalink. I had a good reading month. Books included the interesting 1222 (Anne Holt), starring a cantankerous protagonist; the brilliant Inspector and Silence (Hakan Nesser) the delightful Heavenly Pleasures (Kerry Greenwood), the easy page-turner The Accident (Linwood Barclay) and the fun House at Sea’s End (Elly Griffiths). On the first day of the year, I finished the very relaxing V is for Vengeance. I read a few passable books. I’m ready to move to Melbourne and right into Corinna Chapman’s bakery or go to Norfolk to do an archaelogical dig with another favorite character, Ruth Galloway. And now I have a slew of books by women from Oz to begin. You do me a great honour, Bernadette. Thank you. I shall throw myself back into editing the next Rowly book with a very warm glow indeed. thanks for all these ideas, Bernadette. I must try Miles Off Course some time, obviously, if it did so well against, eg Trackers. Luckily I have read quite a few of your other recommendations, though I am going to have to get on with The Cold Cold Ground now (despite a less than thrilling recent blog post by the author which you pointed out, & previous experience of him being snarky when I reviewed an earlier book by him which is one of my pet hates (author moans), I have been sent a copy and the good reviews here and elsewhere have tipped me over the edge into deciding to read it). It was a tough choice Maxine…Trackers is the other one I was tossing up…but I think there is just a little bit of fairy dust or something in this particular book of Sulari Gentill’s – either that or it just pushes all of my buttons at once – interesting history and humour and a terrific sense of Australian-ness without being over the top (such a hard thing to get right) and a character I am a wee bit in love with. I really can’t work out now why I didn’t give it 5 stars – except that part of my enjoyment is that I keep thinking of things all this time after finishing it that make me smile – and I didn’t know that was going to happen when I closed the cover. Bernadette, first off, your blog is fabulous! I really look forward to reading it. For me, my best reads were MIssing by Karen Alvtegen, Faceless Killers by Henning Menkell and The Business of Dying by Simon Kernick. My favorite was The Darkest Room by John Theorin. I was most disappointed with The Sense of an Ending by Julian Barnes. I know it was a huge award winner, but for me a tad over-hyped. Not awful by any means, but of the eight books I finished, not at the top. 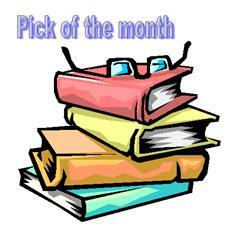 Bernadette, I hope this best books of the month recap is a new and lasting thing! profound book of 246 pages about a shopping mall and its characters still has me smiling. But I’m disappointed that you didn’t review LUCIFER’S TEARS. I saw nothing in Jim’s lengthy article about book reviewers to dissuade you. Are you having another “class warfare” crisis? You are a professional reviewer! Thanks for listing these. My month didn’t start off too well and there were quite a few books that I couldn’t get into. I think February will be a better month. Such a great list of books, as always, Bernadette. I’m still in the library queue for the latest Elly Griffiths, but I just got THE HOUSE AT SEA’S END so I’ll finish that one off first (and hopefully A ROOM FULL OF BONES will be waiting for me at the library by then – well, probably not, but soon, hopefully!). It doesn’t look like my library has MILES OFF COURSE on order as yet, but it’s on my to-read list now.